First of all, make sure that you arrive at hot water beach in time. 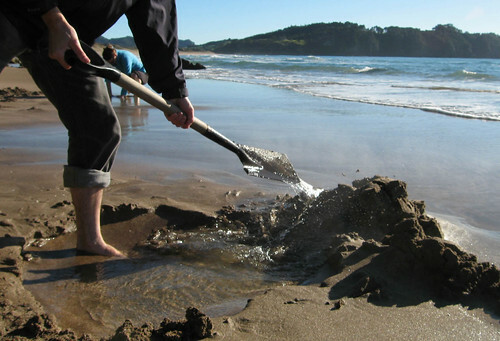 Between two hours before or after low tide is the appropriate time to start digging the hole. The best location for your self-made spa is in front of the first rocks nearest to the parking lot. Don’t think you’ll be able to dig your pool with bare hands, you’ll soon notice a spade is necessary. Other required equipment is swimming suits (togs) since you’ll certainly get wet, a strong pair of biceps, a easy-going type of humor – the waves keep washing your dam away, but don’t give up. You will eventually enjoy your self-made spa. You’ll soon notice there is some sort of competition among the diggers. But as long as you have good team work and maybe one engineer and an architect you should do just fine. One piece of advice: Be careful not to burn your bum!